Molly Flam among the flowers at Morning Glory Farm. Farming on Martha’s Vineyard has become more than a just a career path for a few determined individuals whose parents were farmers. It has also become a trend for many young people who want to know where their food comes from and want to grow it themselves. Mr. Nichols is the field manager at Beetlebung Farm, a relatively small farm in Chilmark with just a few acres of working fields, some greenhouses and a farmhouse where generations of the Fischer family have lived. Recently, the farm workers, including farm manager Chris Fischer, came together at lunchtime to eat a salad prepared from greens picked from the farm. They were joined by Krishana Collins of Blackbird Farm in West Tisbury and her employee, Alisa Javits, a recent graduate of an art school in Boston. Ms. Collins, who grows mostly flowers, talked about the recent trend of young people being drawn to farming, knowing, as she does firsthand, the difficulties the job entails. For many it is knowing where one’s food comes from, of growing it, and understanding the basis of life’s sustenance that attracts them to farming. For others it is more of a feeling. Miss Ralph is 22 years old and this is her second summer working at Morning Glory Farm. Earlier this year she graduated from the University of Vermont with a major in agriculture and a minor in religious studies. Miss Ralph said that at her school there was a large academic interest in agriculture and sustainability, and that one of the interesting things happening in farming these days is that people are approaching it from an intellectual and academic standpoint. In a convoluted food climate where labels, like all-natural, organic, or free range, leave much to the imagination, an intellectual approach to understanding food makes perfect sense. For Miss Ralph it is more important that food be grown locally than to be classified as organic which, “doesn’t always mean what you want it to mean,” she said. There are also personal reasons that keep her working on the farm. “I trust the local foods movement a lot, but I also feel, because I do come from sort of a privileged background just in the sense that I did go to college and I can afford to buy the kinds of food that I want to, that there’s some sense of like, why do I deserve this more than other people, to eat good food, because there’s a lot of people who would like to purchase good food and be responsible about it who can’t afford it and...I feel like I need to work for that privilege,” she said. 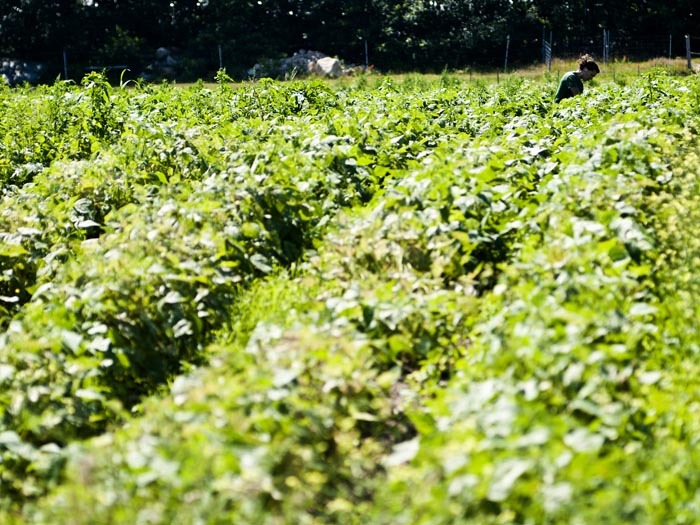 The largest employer of young farm workers on the Vineyard, as well as the largest commercial farm overall, is Morning Glory Farm. Owners Jim and Debbie Athearn started their farm in the late 1970s and have expanded the business symbiotically with the demand for their product. The Athearns have employed young people for many years, but Mr. Athearn has noticed a change of late in the tone of the applications of prospective employees. “In the last five years or so the comments and the volume of young people looking for work on farms is very much focused on ‘I want to experience being on a farm. I want to get closer to my food. I am interested in sustainability,’” said Mr. Athearn. This year he received 60 applications but had to turn 40 away because so many of his workers from last year returned for a second or third season. They are, in general, a group of like-minded individuals. “I’ve thought that we are very fortunate here in the people who come to us, that they’re self selected as being introspective, thoughtful people with a good set of values, for the most part,” said Mr. Athearn. The Morning Glory crew heads into the fields every day at 7:30 a.m. to harvest vegetables to be sold in their farm stand that day, and again at 1 p.m. to weed vegetable beds or to plant new crops in the fields. In the fields, picking vegetables or weeding plant beds, there is a sense of camaraderie among the crew. As they hoe potatoes, weed kale or pick lettuce, there is ample opportunity for conversation, and, while chatting is not their focus, it seems to help create a light attitude that can sustain a day of hard manual labor. 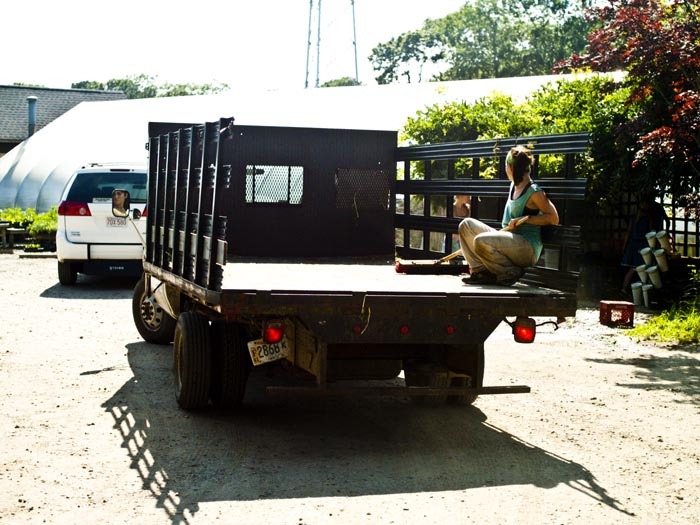 Rebecca Miller, who along with her husband, Matthew Dix, owns and runs North Tabor Farm in Chilmark, feels that this type of community among workers is a key element in her operation. “When you work on a farm, you’re working in a group too so there’s a social aspect to it, especially if you’re doing tedious work, which it is. So it gives you gifts on a lot of different levels. You learn the science part of life but you also learn the social part of life and you learn how to be around people that don’t think like you,” she said. North Tabor Farm’s main crop is salad greens. Their fields are spread across roughly six acres of land, some of which is rented. Ms. Miller also points to the idea of community being important with respect to her customers.